The news-journals that weekend were primarily concerned with the British forces’ ‘Jerusalem Operations’, - fighting that had gone on as part of the Sinai and Palestine Campaign of World War I. 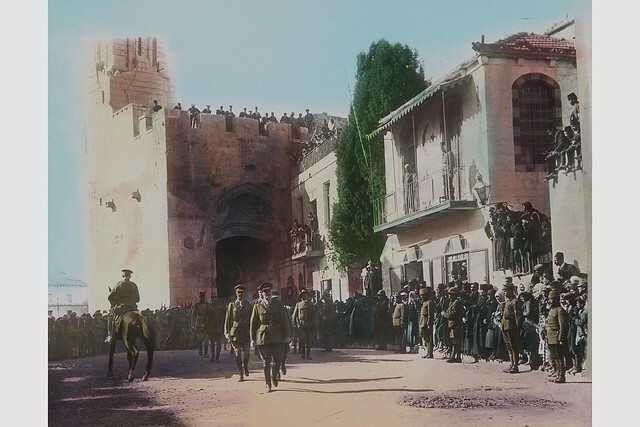 Having taken place largely in the Judean Hills, the conflict had culminated in early December with British forces capturing Jerusalem. It struck me that there is something otherworldly about these great municipal railway stations - it’s the noise and smoke and waves of dispossessed people. I could readily imagine myself lost in some classical depiction of Hell. Having procured a number of newspapers from the bookstall, I walked down the platform and boarded the train in a cloud of filthy air. Due to the mix-up with the tickets, I was still lugging about the carpet-bag that Sibella had packed for me. I planted the bag and the bowler hat into the wooden rack above my head and settled into a seat within the empty compartment. Presently, the compartment began to fill up. A small, sallow-looking man climbed into it, furiously rubbing his hands together. The left leg of his trousers had lost its stitching and hung down behind his heel. As he planted himself into the chair next to me, I was hit by the curiously potent scent of old bread crusts. He was closely followed by a slipshod woman, of robust character, who dropped breathlessly into the seat on my other side. Unclasping the handbag resting on her knees, she delved inside and surreptitiously extracted a large pink saveloy, which she devoured hungrily. I laughed at this, but a succession of angry faces suddenly angled towards me made me realise quickly that the remark was not intended as a joke. The old man’s newspaper lowered and he regarded me fiercely. I was taken aback. Having never been addressed as ‘mate’ before in my life, I resolved, there and then, to purchase a better hat at the first opportunity.